With so many oils and fats available for cooking, it may be difficult to know which ones are the best for each application. Some oils and fats lend themselves better to high temperature, while others work best at low temperatures. 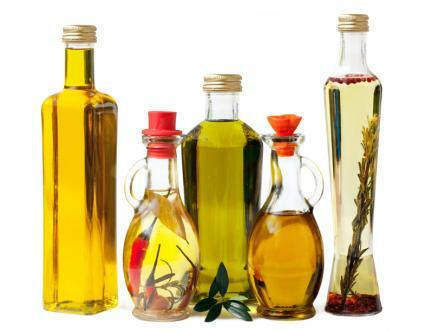 The following table summarizes several different types of cooking oil and fats, as well as the smoke point of them and types of recipes in which it might work the best. Smoke point is an important concept in cooking, because smoke point indicates the temperature where the oil or fat is denatured, which can affect flavor. The chart also lists the type, because specific types of fats and oils play an important role in health and nutrition. The best options for cooking depends upon what and how you are cooking. Saveur lists several oils that work well for deep frying. Canola oil, with its neutral flavor and relatively high smoke point, works well with deep-fat frying. It does not impart off-flavors, provided you keep the fryer in the range of the smoke point, which is 350 to 400 degrees. Canola oil is also monounsaturated, so it's a reasonably heart-healthy oil. Lard has a neutral flavor, and it heats to temperature very quickly, making it a good fat for deep frying. Lard is also saturated, so people on heart-healthy diets may not choose to use it. However, lard is paleo and low-carb diet friendly. When frying with lard, maintain a temperature below 375 degrees. Vegetable shortening also has a neutral flavor that works well for frying. Like lard, it heats to temperature quickly. Unfortunately, vegetable shortening is the least healthy option, because it contains trans fats. Peanut oil has a neutral scent and a reasonably high smoke point. It also renders fried foods darker in color and, in many cases, exceptionally crispy. Monounsaturated fats are also better for a heart-healthy diet. Cooking Light recommends canola, extra-light olive oil, and peanut oil for pan frying due to their clean taste, high smoke point, and health profile. However, in France, chefs like to fry with duck and goose fat because of the tremendous flavor they impart to savory dishes, particularly fried potatoes. Whole Foods recommends several high-temperature oils for sautéing due to their clean taste and health profiles. Try canola oil, avocado oil, and grapeseed oil. For those with a sense of adventure (or those on a paleo diet), try sautéing with rendered bacon fat. Chinese cookbook writer Grace Young suggests several oils for stir frying. According to Young, any oil with a high smoke point is good, but in traditional Chinese cooking, peanut oil is typically used. She also recommends rice bran oil, corn oil, or safflower oil. Bon Apetit's test kitchen recommends oils with a high smoke point for searing - especially canola oil. They also recommend peanut, safflower, sunflower, and soy oils for the task. Paleo dieters and flavor adventurers may also enjoy searing with ghee or duck fat. Bobby Flay recommends using canola oil for most high heat tasks, including grilling. The oil has a high smoke point and a clean neutral flavor that won't interfere with other ingredients. Baking recipes traditionally call for saturated fats such as butter, margarine, and shortening. These are all saturated fats, which may not be heart healthy, but they do make baked goods tender and delicious. Integrative medicine practitioner Chris Kresser says butter is okay, but recommends replacing margarine and shortening with healthier versions of saturated fat such as coconut oil. Chef David Lebovitz recommends using extra virgin olive oil combined with a more neutrally-flavored oil such as light olive oil for flavoring vinaigrettes. Walnut oil also adds flavor to vinaigrettes, but use Chef Lebovitz's trick of mixing it with a more neutral oil. Vegetal and sweet oils such as avocado oil are also good for salad dressings. Bobby Flay says he finishes virtually everything with a little drizzle of extra virgin olive oil to add a bit of flavor. It's a great all-purpose finishing oil. You can also try flavored finishing oils for a little extra pizzazz. With so many choices, it's easy to find the perfect oil or fat for whatever it is you're cooking. With a better understanding of oils and fats, you're sure to become a better cook.